It’s been a good year for Marriott International, with an estimated market value of $35 billion (according to Forbes). Just five years ago Marriott stock was $36 dollars, today it’s $107 a share. Clearly this is a company with a strong growth strategy. The CMO has held a critical role in its growth. Last year Marriott bought Starwood Hotels. The $13 billion merger created the world’s largest hotel company with more than 1.1 million rooms and about 5,700 hotels in more than 110 countries. The merger combines Marriott brands, including Ritz Carlton, Courtyard and Residence Inn, with W Hotels, Westin, Sheraton and other Starwood brands. Now with the merger comes a fresh approach to engaging all those customers, and part of that is the two once separate customer loyalty programs. 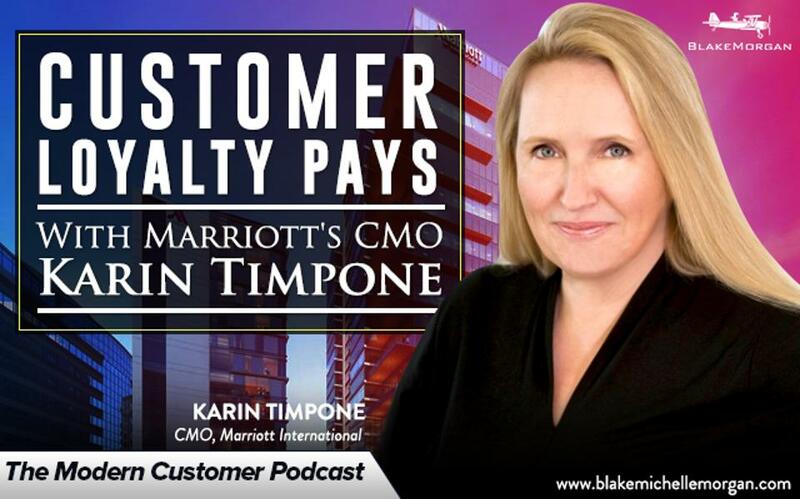 If there’s anyone who knows the benefits of customer loyalty its Karin Timpone, CMO of Marriott International. Timpone, who I interviewed on the modern customer podcast this week, reports that since the Starwood acquisition her role has been consistent. She travels around the world to the many Marriott properties and works with a global team on brand strategy, content strategy, product launches and so much more. Timpone was formerly an executive at ABC Disney Digital Media, Yahoo! and Universal Studios. She joined Marriott four years ago and has since led major growth for Marriott. As mentioned before, Marriott and Starwood now have now linked loyalty programs. If you are a Marriott customer you can use your points with Starwood Hotels and vice versa. Timpone says these customers “stay more, pay more and cost less.” These customers, as you can imagine, are much lower cost per acquisition. But if loyalty is so profitable, why don’t more businesses pursue it? This is one advantage the hotel industry has over sharing economy hospitality companies such as Home Away or Airbnb who do not offer loyalty programs. Marriott doesn’t only focus on loyalty. They focus on guerilla marketing as well and jump on real-time marketing opportunities via social media. One recent example was the Pokemon Go craze. Marriott’s social media team put their efforts on high octane putting Pokémon monsters in pools knowing that guests photographed them and that would possibly go viral. They also surprised guests in rooms with Pokémons on their beds when they checked in. They got wind of one Pokémon Go super user and they decided to sponsor him sending him to Japan, Australia and Europe to catch more Pokémon abroad. Social media is a powerful way for marketing teams to engage with customers in real-time. But this requires marketing to have eyes and ears constantly on the ground of their locations. And customers are enjoying travel now more than ever. And they’re sharing their experiences across Facebook, Instagram, Snapchat and more. But it’s not just one generation that are enjoying travel and talking about it online. There’s a major shift happening in society where more people focus on experiences over owning things, on access over ownership, and it’s not just the younger generations. This is good news for the hotel industry. Great companies like Marriott are participating in social and cultural phenomenon that end up being great marketing for the company. Whether it’s customer loyalty programs, social media or jumping on a cultural and social phenomenon Marriott is at the top of its game.